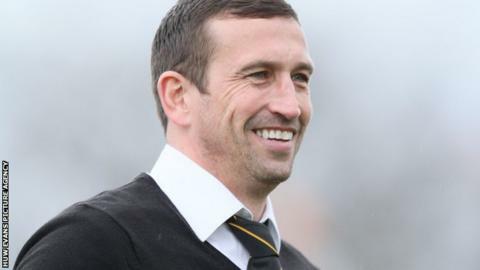 Manager Justin Edinburgh says Newport County have the strength in depth to maintain their place at the top of the Blue Square Bet Premier. The Exiles maintained their position at the top of the Conference with a 2-1 home win over Southport. Newport have lost twice this season but are unbeaten at their new Rodney Parade home. "I think the squad is a million miles in front of what the squad was last year," Edinburgh said. "This squad is capable and more adapt to the Conference and I think that's showing in the results and the performances we're giving right now." Edinburgh brought in nine new players during the summer including strikers Aaron O'Connor and Danny Crow. And the manager says his squad are well prepared to cope with a punishing schedule with a trip to Telford on Tuesday followed by a home game against Grimsby next Saturday. "We know as a group if you're not prepared and not ready for it you can come unstuck," said the former Spurs defender. "We've had a couple of free midweeks of late and we've let the players take the deserved rest. "But we know games are going to come thick and fast again now and we're very much prepared for that."